Standard - €28.99 Only 2 left! Was it the maid in the conservatory with the candlestick? Or perhaps it was the butler in the kitchen with the rope? Or even better…was it the Red Devil, in the sorority, with the [insert murder weapon here…knife, lawn mower, spray tanner]. Move over classic whodunnits—this is one devil of a costume, not for the light-hearted! Keep the spirit of spookiness alive this Halloween and plan your next big scare. Maybe you’ll serve up your pals head (a replica, of course!) at the buffet table; maybe you’ll host a murder mystery party based on your favorite TV show, or perhaps you simply find the idea of pledging a sorority scary enough. 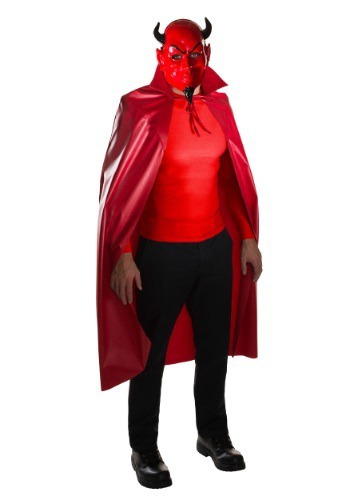 The point is that whatever mischief you plan to get up to during your costumed celebration, make sure you're wearing this Scream Queens Devil Mask & Cape Set so you can keep your identity a secret! And just to be clear, by “mischief” we mean jumping out from behind doors and putting peeled grapes in a bowl and pretending they’re eyeballs, not, you know, a campus-wide killing spree. So dress up like your favorite hidden Hollywood haunter and saunter through the party, eliciting chills of fear. Those who follow Scream Queens will feel their heart racing at the sight of your scarlet silhouette. While those who are in the dark (they don’t know what they’re missing!) still know enough to avoid any mysterious figure in a devil mask. So go wild, haze your fellow partygoers, and turn any ordinary outfit of a red tee and black pants into an homage to comedic horror. Now if you could only solve the mystery of which party guest used the last of the toilet paper without replacing it, you could really give them a scare in return!